A cat with a sensitive stomach may do better with high-quality food. Just like their human companions, cats can have digestion problems. A cat with frequent stomach upset may have a sensitive stomach. A cat with a sensitive stomach can be sad to watch and unpleasant to live with. 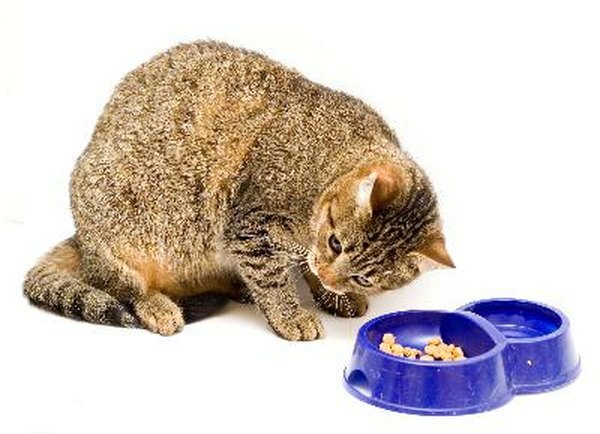 Owners can make simple changes to the cat's diet to soothe stomach issues. Feed a high-quality food that is formulated for sensitive cats. Most common brands have low-quality ingredients like corn and meat by-products. Ask your veterinarian for a recommendation. Some sensitive cats do better on all-natural food that is grain-free and minimally processed. Some people make their own all-natural cat foods so they know the ingredients are safe and fresh. If you choose to do this, consult with your vet first; cats have very specific nutritional needs that can be difficult to satisfy. Ration your cat's meals. 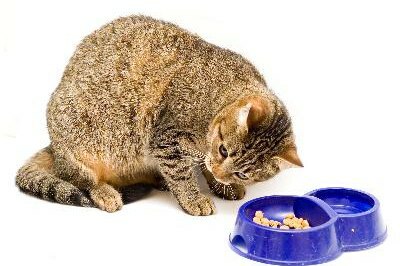 If your cat is a voracious eater, feed her in smaller amounts more frequently throughout the day. Cats who eat too quickly may ingest a lot of air, causing bloat. Do not overfeed. Check with your vet to be sure you are feeding a correct amount for your cat's age, breed and weight. Avoid all milk and dairy products. Cats on television love a saucer of milk, but most cats are lactose intolerant and may feel sick after consuming dairy. If your cat loves the taste of milk, you can buy a special cat milk at the pet store that is lactose-free. Monitor a sensitive cat's diet carefully. Do not switch to new food suddenly. Mix the old food with the new food and gradually increase the ratio of new to old food until she is eating the new food solely. Make sure you do not let her eat any spoiled food, which can lead to internal parasites. Reduce stress in your cat's environment. A stressful environment can affect a cat's digestion. Make sure food and water dishes are offered in a place where the cat feels safe. If you have more than one cat, make sure food aggression is not a problem. If one cat is keeping the other from eating or is eating too much because she doesn't want to share with the other cat, consider separating them during feeding time. If your cat has frequent hairballs, a sensitive stomach may not be the issue. Your cat may need to be groomed more often. Invest in a good cat brush. A cat who has frequent stomach upset may have a sensitive stomach or may be suffering from something more serious. Check with your veterinarian to be sure. Any sudden changes in a cat's behavior or eating habits should be taken seriously. Take your cat to the vet if you notice sudden changes in food sensitivity. What Causes an Upset Stomach in Cats?